These 10 cars are expected to fetch a lot of money at the annual Barrett-Jackson collector car auction in Scottsdale, Ariz next year. 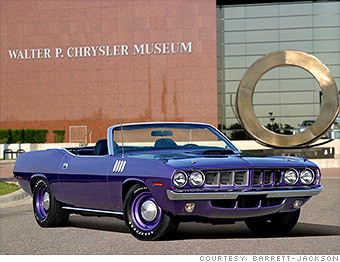 The 1971 Hemi 'Cuda convertible is one of the most valuable muscle cars -- perhaps the most valuable -- ever produced. Only 11 were built that year and all-original examples can sell for well into seven figures. This particular car was a mere shell when it was discovered in a patch of weeds and underbrush on New Year's Eve of 2001. It had been reported stolen 30 years before. Once found, the car was restored to its original condition, including the Plum Crazy paint job. It was the only 1971 Hemi 'Cuda convertible painted in that color. It's one of the "Salon Cars" that auto auction company Barrett-Jackson will sell at its Scottsdale, Ariz., auction in January. These are especially rare, highly collectible cars that can be expected to get top dollar from wealthy bidders.